This past year, I’ve had to deal with a panic attack and a whole lot of anxiety. I’m not an expert in any way so if you were to have any of these feelings, please reach out for help!!! I’m just conveying my experiences as this blog is my diary and I’m finally ready to share what happened to me. 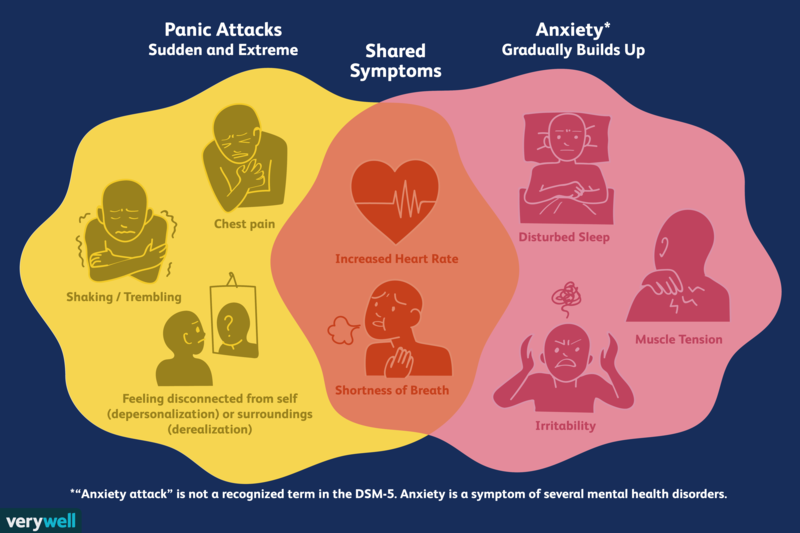 What also helped me understand the difference between a panic attack and anxiety was when I saw the illustration by Joshua Seong on verywellmind.com. If you were to still not understand the difference between the 2, here’s what had happened to me: I went through something traumatic last year (see my former post Racism). I was weirdly fine the day after the riot watching TV on a Sunday. But once I told my colleagues how my weekend went the next day, that’s when the repercussion started. Talking about it out loud made me understand the danger I was in and I finally cried. By naivety, I thought that that was going to be it: tears would cleanse my heart and I was letting it all out so that would solve it all right? Nope, not this time!!! I was standing in the metro the next day to go to work (no seats available) and lots of people barged into the metro when I was at Central station like always. Unfortunately, that’s when I had my very first panic attack. I was suffocating, couldn’t breathe, my heart was racing like crazy, I was having hot flashes and I felt dizzy. I don’t know if it was my rational thinking or my basic instinct that saved me, I just knew I had to focus on my breathing until I reached my destination. Once I was out of the metro, I sat down, took time to calm down my heart rate and went back to every day life. That same week, my friends who live 5 minutes away asked if I wanted to have dinner at their place and the apprehension I felt for walking late at night from their front door to the bus stop (which is only a 1 minute walk) drove me mad. Small noises I heard in the streets while I was trying to sleep kept me up most of the night, I avoided any crowded places (no more going out for drinks) cause I was afraid I’d have another panic attack. I could give you so many more examples of irrational fears because sadly it had lasted for months. I knew I couldn’t possibly live like that so the way I handled it was by facing every fear I had one step at a time. I was afraid to walk outside in the dark (remember that it’s pitch dark from 4PM on in winter time), so every day I started taking 30 minute walks outside before heading home so I would feel safe in my own environment again. Just so I would have a social life again, I would start by going to friends’houses for gatherings and then slowly expand to restaurants and eventually truly crowded places like bars and festivals. I was meditating every day so I would get some sleep again. I went to stay at my parents’ just to have a change of scene and most importantly, I went back to the exact same spot where the riot happened. The point was that I refused to let fear take over my life!!! I also have to mention that I haven’t shared this with my family at all. I was in such a horrible state, I needed them to just be normal and I didn’t want them to lecture me or worry too much because I had to keep my focus on myself. So now that you know, go ahead and yell at me! It’s ok, I can handle it now. Don’t get me wrong, talking is extremely important and although I hadn’t seen a shrink or went to my family, the ones who immediately knew, were my besties. They’re the ones who kept me up and going. Again, if you were to go through something traumatic or if you were to feel the way I’ve felt, please seek out for help!!! I slowly regained my normal state so I didn’t feel the need to see a therapist but it did take months for me to get better and there are still weird moments where I all of a sudden would get anxious again. But so far, I’ve slowly managed to overcome my fears and am slowly getting back to my zen state. The reason I’m writing this post now though, is my cousin B. You may live on the other side of the world but by sharing how we felt, you gave me courage. So keep talking B, I know you’re going through tough times now but I know you’ll end up on the other side too. Good luck and stay strong!! !